Anyway, here it is........ my newest wallie base on fate/stay night. spent 2 days and few hrs. 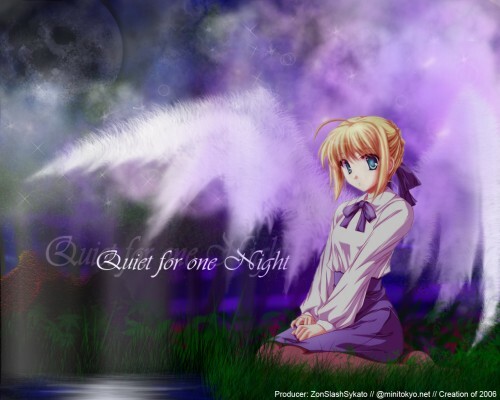 First of all, Saber is sitting there very peacefully for ONE night. Secondly, the WINGS are fake. They are just illusions created by the effect of the clouds.The wings took me like 1hr. to finish it because I kept on messing it up. And ..... I donno wut to say about this. I just hope everyone likes it cuz I put alot of effort in this wall the most. Durn it, I can't wait to see this anime, and this great wall certainly doesn't help! Excellent work -- the effects really do take it another level all-together. aaaaaaH, qué bonito Wall de Saber, como si fuera un angel. Me encanta que esté a la luz de la luna con tonalidades moradas (mi color favorito), muy buen trabajo!